There’s still no word, whether official or rumored about the Sony Xperia Z4. Sony seems to paying eased attention towards its flagship manufacturing with official silence from the company about the device. When compared to LG, who seems to paying quite a lot of attention to the soon to be expected LG G4, there’s no word from Sony on when can we expect the Z4. But thankfully for leaks, we get to know a little more about the device today. Onleaks is back today, and this time he claims to have some information about the Xperia Z4. According to a tweet by the leakster, the Xperia Z4 will be following in the Z3’s footsteps when it comes to dimensions on the device. We’ve suspected similar details about the device courtesy of a leaked Xperia Z4 digitizer last year that showed several design changes of which the dimensions were not a part of. And similarly, according to Onleaks, the Xperia Z4 will be measuring 146.3×71.9×7.2mm as can be seen above. For comparison sake, the Xperia Z3 measures 146 x 72 x 7.3 mm. While we don’t know when the Xperia Z4 will be hitting the shelves, a few leaks have given us a rough idea of what changes to expect on the device. 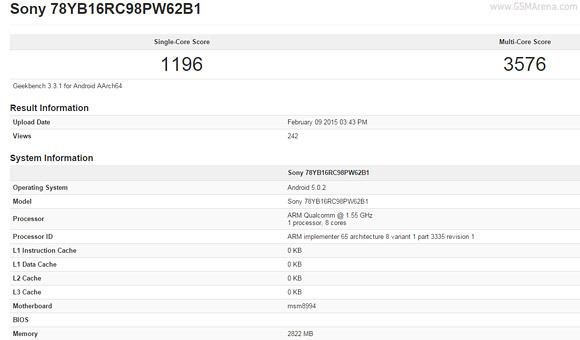 The Xperia Z4 will be coming with the Snapdragon 810 on board coupled with 3 GB of RAM. The device will also be allegedly coming in two screen resolution variations, namely 1080p and QHD, depending on how fast you like your battery to be drained. All of this will be supplemented by 3 GB of RAM which should prove to be sufficient for most and Android 5.0.2. Whether Sony will choose to launch the device with Android 5.1, given that its started its partial rollout to Nexus devices isn’t known. But given the company’s slow track record related to Android updates, you shouldn’t have your hopes up. Stay tuned, we’ll keep you updated.